필암서원은 조선 선조 23년(1590)에 창건되고, 현종 3년(1662)에 왕에게서 사액을 받은 서원이다. 여기에는 김인후(1510∼1560)와 양자징(1523∼1594) 두 분의 위패를 모시고 있다. 김인후는 조선 중기의 유학자이자 문신으로, 1540년 문과에 급제하여 벼슬길에 올랐다. 을사사화가 일어나자 병을 핑계삼아 나아가지 않고 고향인 장성으로 돌아갔다. 시와 문장에 뛰어나 10여권의 시문집을 남겼고, 그의 성리학 이론은 유학사에 있어서 중요한 위치를 차지한다. 이곳에서 지정된 유물은 총 14책 64매로, 창건당시부터 보존되어 온 것이 아니라 인조 2년(1624)부터 1900년경까지의 자료들이다. 필암서원 문적 일괄(筆巖書院 文籍 一括)을 보면, 필암서원의 역대 원장들을 기록한『원장선생안』, 학생들의 수업을 담당한 교관, 강의에 참석한 인물의 명단 등을 기록한『보강안』, 강회 참가자의 명단인『문계안』, 필암서원 소속 유생들의 명단인『서재유안서』, 필암서원의 재산을 기록한『필암서원원적』, 장성부사가 필암서원에 내려준『장성부사하첩』등이다. Piramseowon is a Confucian academy founded in 1590 (the 23rd year of King Seonjo’s reign). 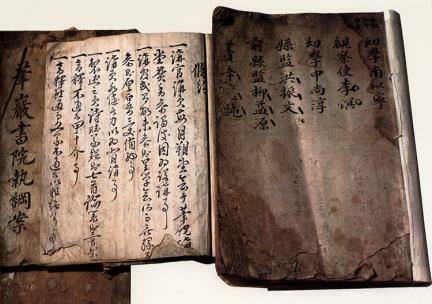 It was awarded a name tablet by the king in 1662 (the 3rd year of King Hyeonjong’s reign). 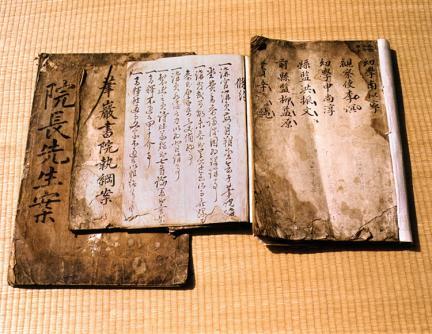 In its shrine are honored the memories of Kim In-hu (1510-1560) and Yang Ja-jing (1523-1594). Kim In-hu was a Confucian scholar and a government official of mid-Joseon. His government career began in 1540 when he successfully passed the civil service examination. At the outbreak of Literati Purge of 1545, he left the capital city for his hometown Jangseong, on the false pretext of an illness. An accomplished poet and penman, Kim In-hu left ten collections of poetry and essays. Neo-Confucian theories developed by him are also considered highly important to the history of Joseon Confucianism. The Treasure-designated documents are sixty-four sheets in fourteen books. 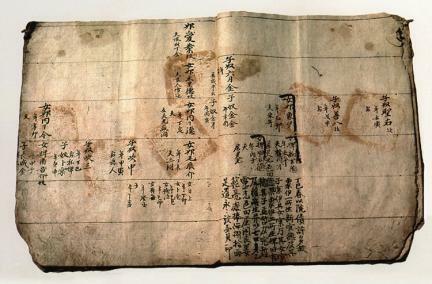 The documents span about three hundred years from 1624 (the 2nd year of King Injo’s reign) to 1900 and range from Wonjang seonsaengan which lists the names of all past directors of the Confucian academy to Bogangan, the list of names of instructors and seminar participants, Mungyean, the list of memorial participants, Seohaeyuanseo, the list of students, Piramseowon wonjeok, the list of the Confucian academy’s assets and properties, and Jangseongbusa hacheop, a document given from the Governor of Jangseong to the institution. 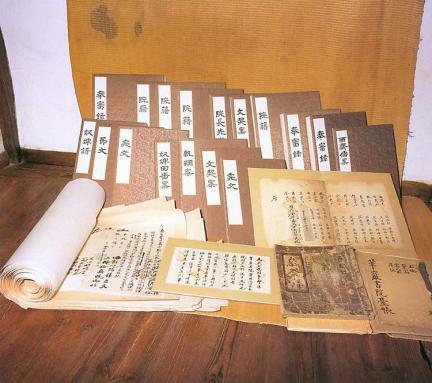 These various documents, telling of how Piramseowon was organized and run, are of great significance for research into local educational institutions in Joseon and the social and economic history of this period.